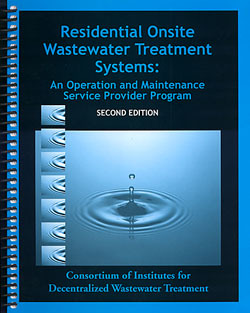 Residential Onsite Wastewater Treatment Systems is an award winning publication that sets the standard for O & M activities across the country. Developed by the Consortium of Institutes for Decentralized Wastewater Treatment (CIDWT), with partial funding by the U.S. Environmental Protection Agency (EPA) and the Water Environmental Research Foundation (WERF). Written by 12 academic and professional experts and independently reviewed by 35 experts from major universities, professional associations, government agencies, and businesses.